Come and Join hands with Castor Institute of marine & engineering education Pvt. ltd. And begin your career in Merchant navy as an officer. CIMEE coaching classes is the best place for aspiring candidates who wants to start a career in Merchant navy as an officer.10+2 passed out candidates and appearing also can join. At CIMEE we prepare out students by giving them the best study materials including the Marine company's selection procedure for sponsorship test. 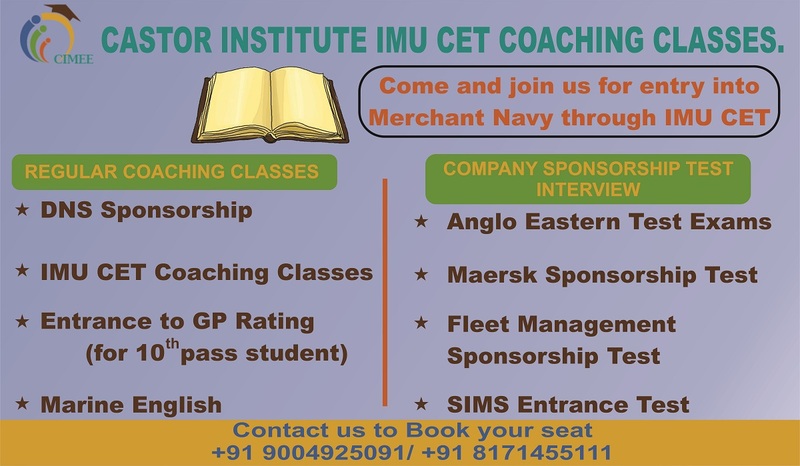 We Offer One of The Best IMU CET/ Merchant Navy Entrance/ Sponsorship Test Preparatory Classes. why Choosing CIMEE coaching classes for IMU-CET is the best idea? At CIMEE coaching classes we understand that the preparatory classes are the best way to crack and Entrance test and at the same time we also understand that the tutors should teach the students in a very effective manner. We have best tutors who prepares the students as per the requirements of the IMU-CET syllabus and the company sponsorship tests. What we do at CIMEE coaching classes? Preparing them for Shipping Company's Sponsorship tests. Preparing candidates for shipping companies sponsorship tests & Interview. Providing them with the latest updates about Company Sponsorship Application & Selection Procedure. Focusing on Specific Areas of Improvement of each candidates. The Application process is online only, No offline applications. The fee for IMU-CET is 1000/-INR for general candidates and 700/- INR for SC/ST category candidates. After uploading the documents, candidates will be able to download the filled in application form. IMU-CET is conducted as CBT exams across India. For Every Correct answer, applicant will score 1 mark. There is no negative marking for incorrect or unanswered question. Relaxation Policy: - For applicants belonging to SC/ST, a relaxation of 5% of the aggregate marks will be considered for all programme except in English subject marks. Marital status: - Only unmarried Individuals are eligible. Candidate for admission to marine courses (DG shipping approved courses) are required to produce certificate for medical fitness by Doctors approved by Director general of shipping. The candidate must be medically fit and should meet the medical requirements as specified by DGS guidelines. Candidates with disability (DA) are not eligible. For DGS approved courses viz DNS, there should not be any degree of squint or any morbid condition of eyes or of the eyelids that is liable to aggravate or recur, pressure of trachoma and iris complication sequel. Movement of the eyeballs must be full in all directions and the pupils should react normally to light. Candidates joining DNS course, colour vision shall (Unaided 1.0 (6/6) in the better eye and 0.67 (6/9) in another eye.